Everybody says that shopping in Iceland is expensive! Well, it is, in some ways. It is expensive to live in a small community far from other countries. It is expensive to import almost everything, from bread to cars. Container ships are constantly sailing to Iceland from Europe and America, chock-full of groceries, furniture, machines, clothing, you name it. Still, things have improved. Fruit and vegetables used to be luxury items a few years back, only to be consumed at Christmas. Well, this has changed. Icelandic hothouse tomatoes, paprika and cucumbers are widely available, not all year round, but almost. Some grocery stores are not expensive at all, even compared to similar stores in, say, Denmark. Look for the excellent Bónus stores (logo: a pink piggy bank on a yellow background) for no-nonsense basics. For the fancy stuff, you might try Nóatún or Hagkaup. They have a wide range of products flown in, but of course, it will cost you a bit extra to go shopping there. All of these stores are to be found in several locations around the country. If you like wine and spirits, youll have to go shopping in the state-owned stores, and you might find the price a bit hard to swallow if you come from a country where such beverages are not heavily taxed. We assure you that there have been improvements. Things used to be much more difficult for wine lovers a few years back. Just remember that beer was banned in Iceland until 1989. Can you believe it? Now the place seems to be brimming with beer on a Saturday night. Liquor was not to be bought in bars on Wednesdays. No kidding, it used to be like that. Now, why was that? You had to make do with soft drinks. This was because Iceland used to host the US army at the NATO base in Keflavík (yes, that's where the airport is located), and the soldiers were allowed to leave the NATO-base on Wednesdays. You're never too careful, better keep the boys off the drink... but all this is history, as the US army has now deserted the NATO base forever. Youll find the main shopping street in downtown Reykjavík. As often is the case in this capital, youll find contrast and paradox at every corner. This street is at once ugly and beautiful, filthy and well-kept. Laugavegur means hot-spring street, so called because there were hot springs there where the housewives could wash their dirty linen in warm water. This is where people march on May first. 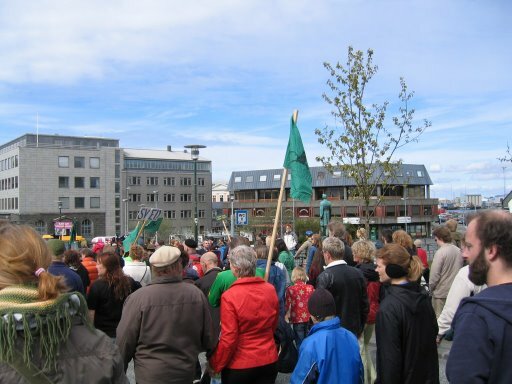 The procession leaves Hlemmur (which means literally: lid), a horrible square overwhelmed by the police station and the oddly ugly central for Reykjavík public busses, an Orwellian invention best left alone, yet another paradox in Paradox City. The authorities did try a face lift, but the results are far from convincing. Still, it is worth seeing as an architectural oddity of sorts. Laugavegur is the main shopping street in city center, but you like slumming in strange and exotic places, you might want to go for a spree of shopping in Kolaportið, just across the Lækjartorg square (picture center). As you leave Hlemmur, you cross Snorrabraut, the street which used to mark the limit of the capital to the east until fairly recently, and then walk down Laugavegur to the west, heading for the city center, passing through Bankastræti, bank street, no less, until you come to Lækjargata. 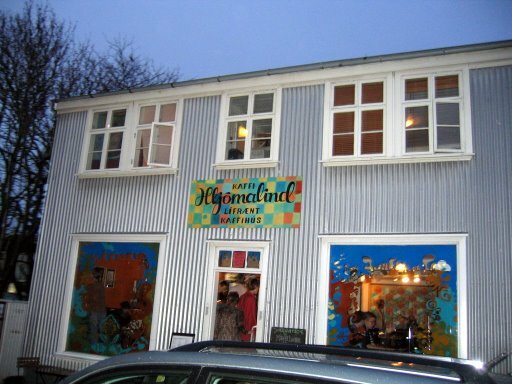 When you are about halfway down this main shopping street, Laugavegur, you pass café Hljómalind, a favorite of ours. 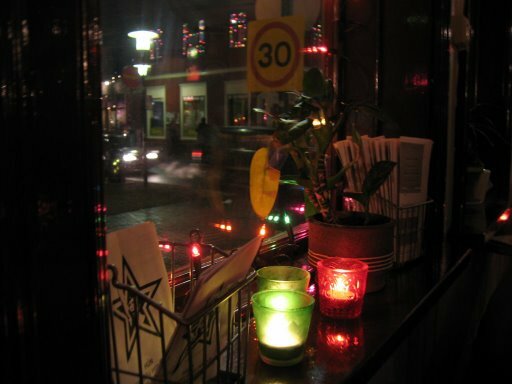 The setting is old-fashioned and quaint in a subdued way, grandmother furniture and candle light. You've guessed it already, this is our favorite hang-out. You won't get beer and you won't get booze, but you'll get a nice soja latte, a hearty bowl of soup or a vegetarian meal. Laugavegur is the main shopping street, but if you like slumming in strange and exotic places, you might want to go for a spree of shopping in Kolaportið, the flea market in a garage by the Reykjavík harbour, opened Saturdays and Sundays from 11 a.m. to 5 p.m. 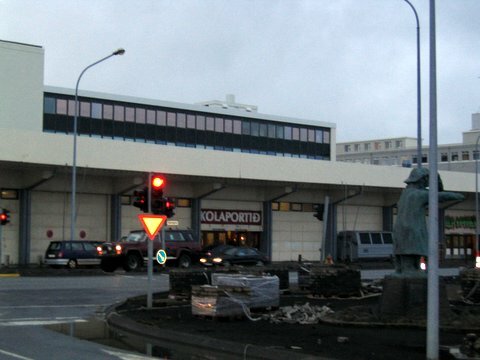 The Reykjavík flea market is called Kolaportið, the Coal Port. This is a funny name for Iceland, since there is no coal to be found anywhere. Once upon a time, they used to import coal to run the steamers. A lot of hot water has run under the bridges since. There are bargains to be made in Kolaportið, that's for sure. Youll find Icelandic hand knit woolens, all sorts of second-hand clothes, tons of books, CDs, DVDs, candies, liquorice, the weird specialty of fermented (or rotten) shark and dried fish. 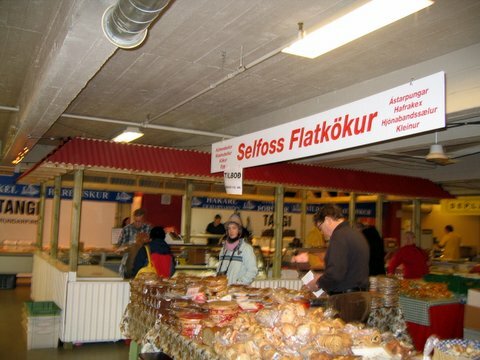 Personally, I prefer the flat cakes - flatkökur - found in Kolaportið to any other bread found in Reykjavík. This is also just the spot if you are looking for nice potatoes that have not been smoldered in plastic for weeks. Surprisingly, you can get luxury items at a good price in Reykjavík. If you like glamorous clothes, downtown Reykjavík is just the place. A great many talented Icelandic designers have set up shops along the main shopping streets, where you are sure to find striking and unusual designer clothing at fair prices. 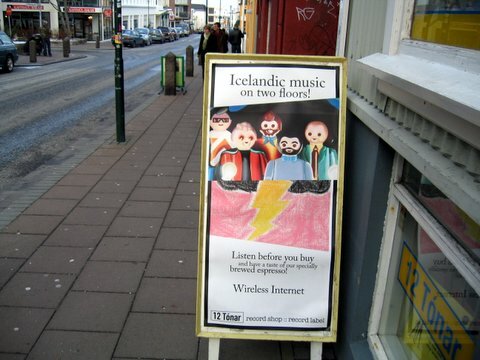 There are some fine music stores in Reykjavík. 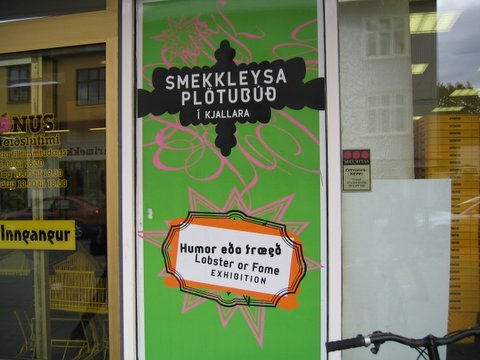 One of them is the Bad Taste (Smekkleysa in Icelandic) shop. This is also a famous music label, founded by Björk and her colleagues several years ago, and still going strong. 12 tónar is a lovely shop, carrying a wide range of music for all tastes. Their espresso is fine, too. Remember, if youre only visiting, or if youre planning to go back to your country of origin, you can get VAT refund at the airport. All you have to do is present a refund slip you get when you buy an item. You get a bag not to be opened while you stay in Iceland. You can save a lot of money that way, as the VAT is rather high in Iceland.